A local gin company has had one of their products shortlisted for the title of best in the world, after it was announced as a category winner for the 2017 World Gin Awards at the end of last week. 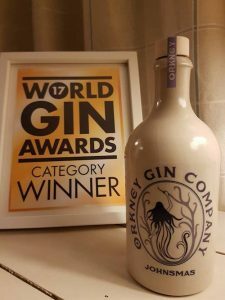 Johnsmas Gin, which is produced by the Burray-based Orkney Gin Company, has been picked as a category winner in the awards’ (compound) UK section. The gin will compete with five other gins from around the globe to be named the world’s best gin in 2017. The title will be announced on March 30th in London. “It took over one year to come up with the final recipe for Johnsmas. We tasted nearly every botanical available but stuck with our instincts and used the highest quality botanicals from Orkney and beyond.